Errol Spence Jr. knows Mikey Garcia is taking a risk facing him this Saturday but he also knows a win over the four-division world champion puts him in the best “pound for pound” conversation. While both boxers have shown one another respect leading up to the pay-per-view this weekend at the AT&T Stadium in Arlington, Texas, Pence made it a point to let Garcia know he will be in for a fight on Saturday night. 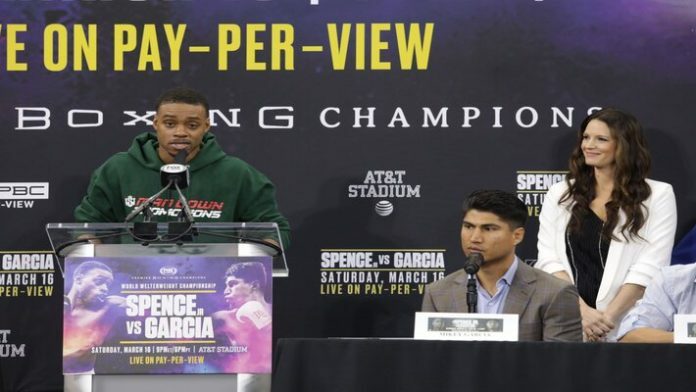 “I’m going to punish him and make him wish he took his brother’s advice to not take this fight.” – Errol Spence Jr.
With all the press appearances and promotion done for the event, Garcia has not only underlined the risk but also said he was told not to accept the bout. In combat sports, trash talk comes with the territory but much of what is said is intended to be delivered after the first bell. Spence vows not only to punish Garcia but deliver a finish on Saturday night. Do you think Spence will be the “face of boxing” if he wins?